Princess Diana’s most iconic outfits may have been styled back in the ’80s and ’90s, but as you may have noticed from her impeccable wedding guest looks to her style signatures, a lot of her best looks are still super relevant. We’ve even spotted the likes of Zara tapping into some of Diana’s most beloved trends. So it makes perfect sense that since Diana’s style has made an everlasting impression on us all—her go-to outfits for a day at Royal Ascot are totally worth taking inspiration from in 2018. What to wear to the races can be a tricky outfit dilemma, especially when dress codes and formal traditions come into play. 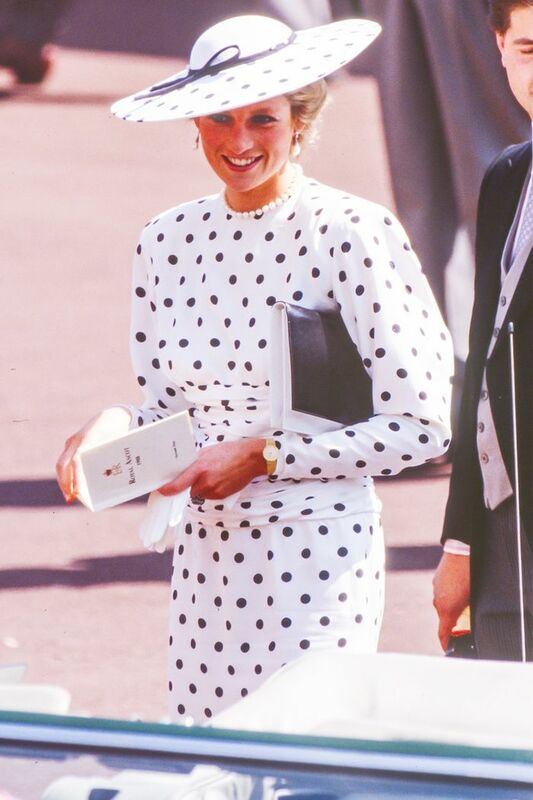 But follow Diana’s lead, and you’ll be styling up endless looks from polka dots and pencil skirts to statement hats in no time. Keep scrolling to see our pick of Princess Diana’s best Royal Ascot outfits, with all the shopping you need down below. Polka dots head to toe. It was a big year for accessories in ’97—just check out the floral trimmings on that straw boater. This bold turban hat is giving us life. When in doubt, go all pink. We’ve got a lot of love for the strong polka dots on Sarah Ferguson here. Chic separates don’t always need to be colour co-ordinated. Here’s the proof. Never underestimate a good hat. Going for a bold print? Take a tip from Diana and accessorise in just one colour. Navy and white always looks classy. The full look in all its glory. You can't go wrong with a nautical nod. This is giving us Pretty Woman vibes. Take away the purple accent, and this is a full 2018 look. Pencil skirts and power shoulders. Layer it with a chic jacket. Clash it or co-ordinate it. Either way, it’ll add a smart finish. Pair with a striped jacket for the full Diana effect. The perfect base for getting creative. For a simple update, just add a silk scarf.